In 1867, Bishop Edward Fitzgerald had six parishes in Central and Southern Arkansas, and only six priests. With 1500 parishioners in Arkansas, he needed a priest in the Northeast. In early 1868, Pocahontas businessmen Dr. James Esselman and Dr. Putman and his Catholic wife invited an Irish missionary priest from Memphis, Rev. James P. O'Kean, to come and preach. His fiery preaching excited the townsfolk. They petitioned the bishop to assign Father O'Kean to Pocahontas. Mostly protestant residents donated the funds and a new wooden church was build on a hilly tract of land, nicknamed "Catholic Hill". The church was dedicated by Bishop Fitzgerald in August 1868. He then established the cemetery in 1869. Father O'Kean was a fiery preacher and a good educator, soon increasing the members from two to one hundred, due in part from a few immigrant families arriving to the area. In 1869, the railroad was finished and the railroad station town of O'kean was named after him. In 1871, he was made Rector of St. Andrews Cathedral in Little Rock. For eight years St. Paul parish had no pastor. O'Kean and Father Tom Reilly came from St. Andrews to preach four times a year. Church membership dwindled to nineteen. Times were hard. Then in 1879, Rev. John Eugene Weibel came to Pocahontas. He was a Benedictine missionary from Switzerland. Weibel was zealous, demanding and well trained. He went to work teaching children and converts, building the first school house, starting a choir, buying an organ, recruiting immigrant families and nuns and visiting missions on the iron mountain railroad. Many immigrants began arriving from Northern Europe in 1880, bringing a strong Orthodox faith. More immigrants soon followed including names : Baltz, Barre', Barthel, Brodel, Blissenbach, DeClerk, Dohman, Dust, Frenken, Frangenberg, Gschwend, Jansen, Junkersfeld, Kiefer, Meier, Muyers, Nuce, Peters, Schneider, Schaechtel, Schmidt, Thennes, Throesch Thielemeir, and Wurtz. In his first years, three groups of nuns came to teach but left because of the harsh conditions. In December 1887, four Benedictine sisters came from Clyde, Missouri and established Maria Stein Convent. Their numbers grew quickly and their devotion, hardships and service to St. Paul's Parish and School were edifying. Father Weibel established churches in Engelberg, Paragould, Jonesboro, Hoxie, Imboden, and Peach Orchard. In 1889, he moved to St. Roman's Church in Jonesboro. Devotions and prayers were strong and rooted in the growing families and parish, fostered by the pastors and nuns. 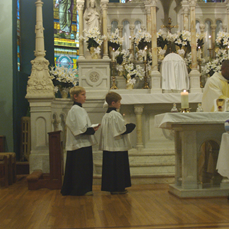 Catholicism wa flourishing in Northeast Arkansas from the mother parish of St. Paul. The nuns were teaching in a dozen or more parishes. In 4898, Father Matthew Saettle came and knew that a new church building was needed for the 100 families. A grand limestone Romanesque building was started, with rock gathered from nearby quarries and most of the labor donated. It was dedicated in 1904. The most beautiful Catholic Church in Arkansas with exquisite imported stained glass windows, Carrara marble alter and Sanctuary rail. Pastors that followed built on the foundation stones of St Paul: zealous pastors, families, nuns, school and devotions. A two story red brick rectory, school house and hall were build. The grotto, which stands on the site of the original wooden church, was built during the depression in 1934. The high school began in 1939, the present school was build in 1948, the convent in 1957, the rectory/office in 1963 and the gym/parish center in 1974. Many changes came following World War II with loss of vocations, devotions, holy objects, prayer and large families declining. Deacon George Edwards, our first married deacon, guided the choir and music for 41 years through the difficult reform period. Parish councils, English liturgy, RCIA, PRE and other sacramental reforms came following Vatican II. After four renovations, this building radiates beautifully the heart of renewed, strong Catholic faith at St Paul's nearly 150 years later! Marion devotions are restored, Perpetual Adoration began in 1996, and prayer and the Rosary are strong again, assisted by a charismatic and evangelistic wave of fervor Converts are many. The uninterrupted 140 years of schooling our children in faith and Orthodoxy continues with a vibrant elementary school and Parish Religion Education program. Welcome friend, visitor, descendent-come see the presence of God at St. Paul's in cedars and oaks, stained glass and statues, altars, and art, signs and symbols, oils and organ, color and candles, prayer books and bulletins, faces and faithful and in hushed silence! Praise God! !